Stephanopogon is a distinctive group of unicellular, multiflagellated eukaryotes that inhabit marine sediments. All six species of Stephanopogon are predators of bacteria, diatoms and small flagellates and are capable of crawling forwards and backwards using an array of flagella on the ventral surface of the cell. The cells range from 20 – 90 µm in length, are dorsoventrally flattened and contain 2 to several isomorphic nuclei (depending on the species). The flagella (= cilia) are inserted in 6-14 longitudinal rows on the ventral surface of the cell (depending on the species) and are scarce on the dorsal side of the cell. Stephanopogon reproduces by asexual division within a resting cyst; evidence of sexual reproduction has not been observed. Although the genus is cosmopolitan, cells are not particularly common or abundant in natural environments. Of the six known species, only two have been investigated at the ultrastructural and molecular phylogenetic levels, namely S. apogon and S. minuta (Cavalier-Smith and Nikolaev, in press; Lipscomb and Corliss 1982; Patterson and Brugerolle 1982; Yoon et al 2008; Yubuki and Leander 2008). The earliest morphological studies indicated that Stephanopogon was an unusual member of the Ciliata; however, detailed ultrastructural and molecular phylogenetic data have demonstrated that the genus is actually an even more unusual member of the Heterolobosea (see Phylogenetic Position of Stephanopogon). The life cycle was studied in S. mesnili and S. colpoda by Lwoff (1936) and Raikov (1969), respectively, and was shown to consist of two stages (Fig. 1): (i) a trophic stage involving actively swimming flagellates and (ii) a resting cyst stage. For instance, the flagellates in S. colpoda contain two identical nuclei (Fig. 1a). Through hypertrophic growth and asynchronized mitotic nuclear division, the number of nuclei increases within the flagellates to 12 or 16 (Fig. 1b). These ‘mature’ flagellates then encyst, and the cytoplasm is separated so that each daughter cell contains one nucleus (Fig. 1c). Before germination from the cyst, the nucleus within each daughter cell divides, producing two identical nuclei (Fig. 1d). The binucleate daughter cells then excyst and become actively swimming flagellates, the so-called trophic stages. The phylogenetic position of Stephanopogon within eukaryotes was uncertain until 2008. This enigmatic genus was originally described as a ciliate based on characters like swimming behavior, the cytostome, the binuclear condition and longitudinal arrays of flagella (cilia). 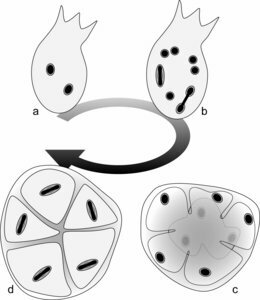 However, observations of the life cycle showed that the nucleus of Stephanopogon was not differentiated into macronuclei and micronuclei as in ciliates. Thus, Stephanopogon was inferred to be a ciliate with ancestral features; the isomorphic nuclear state in Stephanopogon was thought to reflect ciliate ancestry before the origin of heteromorphic nuclei (Corliss 1979; Raikov 1969). The phylogenetic position of Stephanopogon was reevaluated after the ultrastructural studies demonstrated that these organisms differ from ciliates in having discoidal mitochondrial cristae and lacking cortical alveoli, infraciliature, Golgi bodies and heteromorphic nuclei (Lipscomb and Corliss 1982; Patterson and Brugerolle 1988). Following these ultrastructural studies, the classification of Stephanopogon was even more uncertain, and different systematists placed this genus into several different super-groups, such as the Chromalveolata (Ciliophora) (Hayward and Ryland 1990; Lei et al. 1999), the Excavata (Euglenozoa and Heterolobosea) (Lipscomb 1991; Cavalier-Smith 2003), and the Rhizaria (Spongomonadea) (Cavalier-Smith 2002). However, many researchers in the field took a more conservative approach and assigned the genus as incertae sedis within eukaryotes (Adl et al. 2005; Hausmann et al. 2003; Larsen and Patterson 1990; Patterson 1999; Simpson 1997). Based on comparative morphology and phylogenetic analyses of small subunit ribosomal RNA gene sequences, Stephanopogon is now strongly positioned within the Heterolobosea and closely related to Percolomonas (Cavalier-Smith and Nikolaev in press; Yubuki and Leander 2008). Stephanopogon is the only multiflagellated (>>6 flagella) genus within the Heterolobosea. In addition to robust molecular phylogenetic data showing Stephanopogon as a derived member of the Heterolobosea, S. apogon (Lipscomb and Corliss 1982; Patterson and Brugerolle 1988) and S. minuta (Yubuki and Leander 2008) share several ultrastructural features with other heteroloboseans, such as discoidal mitochondrial cristae and the absence of canonical Golgi bodies. S. apogon and S. minuta also share several features with Percolomonas in particular, such as mitochondria that are not enveloped by endoplasmic reticulum, an electron dense globule on the proximal end of central pair of microtubules in the axoneme, and the presence of fibrous sheets attached to the proximal end of the basal bodies. The ultrastructural features shared by Stephanopogon and Percolomonas reinforces the molecular phylogenetic data and demonstrated that Stephanopogon is a highly divergent multiflagellated heterolobosean that represents an outstanding example of convergent evolution with ciliates. The type species of the genus is S. colpoda Entz 1884. The morphological characters used for the taxonomic delimitation of the six known species are the presence/absence of oral barbs, the number of the barbs (if present), the cell size, and the number of longitudinal rows of flagella on the ventral side of the cell. The phylogenetic relationship among the six species of Stephanopogon remain somewhat uncertain because only two species, S. apogon and S. minuta, have been examined at the ultrastructural and molecular phylogenetic levels. Nonetheless, available morphological data is sufficient to propose a hypothetical framework for inferring the evolution of some distinctive characters, such as the number of barbs, the number of flagellar rows on the ventral surface of the cell and cell size. Using Percolomonas as an outgroup, we can infer that the plesiomorphic states for Stephanopogon include the absence of apical barbs and fewer numbers of flagellar rows; thus, comparative morphology suggests that the number of barbs and flagellar rows increased during Stephanopogon evolution (Fig. 2). The six species can be separated into three main lineages: lineage I (S. apogon), lineage II (S. minuta and S. mobiliensis) and lineage III (S. paramesnili, S. colpoda and S. mesnili) (Fig. 2). The most recent ancestor of Stephanopogon species lacked barbs and possessed 6-7 flagellar rows much like the character states found in S. apogon (Fig. 2, position 1). Three apical barbs on the ventral lip of the cytostome developed in the most recent common ancestor of lineage II and lineage III (Fig. 2, position 2). One to two flagellar rows were added on the ventral side of the cell in the most recent ancestor of lineage II (Fig. 2, position 3). Two additional barbs were added to the dorsal side of the cytostome along the lineage leading to S. mobiliensis (Fig. 2, position 4). The cell decreased in size along lineage II (Fig. 2, position 3); S. minuta and S. mobiliensis are the smallest known members of the genus. The number of flagellar rows doubled from about 6 to about 12 in the most recent common ancestor of lineage III, consisting of S. paramesnili, S. colpoda and S. mesnili (Fig. 2, position 5). In S. mesnili, a very subtle fourth barb formed on the ventral side of the cytostome near the main central barb; however, all four barbs became relatively inconspicuous in this lineage (Fig. 2, position 6). The relative cell size in lineage III is apomorphic with S. apogon; all four species are approximately the same size. The phylogenetic hypothesis shown in Figure 2 will be tested and refined as DNA sequences become available from more species of Stephanopogon. Adl, S. M., Simpson, A. G. B., Farmer, M. A., Andersen, R. A., Anderson, O. R., Barta, J. R., Bowser, S. S., Brugerolle, G., Fensome, R. A., Fredericq, S., James, T. Y., Karpov. S., Kugrens, P., Krug, J., Lane, C. E., Lewis, L. A., Lodge, J., Lynn, D. H., Mann, D. G., McCourt, R. M., Mendoza, L., Moestrup, Ø., Mozley-Standridge, S. E., Nerad, T. A., Shearer, C. A., Smirnov, A. V., Spiegel, F. W. and Taylor, M. F. 2005. The new higher level classification of eukaryotes with emphasis on the taxonomy of protists. J. Eukaryot. Microbiol. 52:399-459. Cavalier-Smith, T. 2003. Protist phylogeny and the high-level classification of Protozoa. Europ. J. Protistol. 39:338-348. Cavalier-Smith, T. and Nikolaev, S. In press. The zooflagellates Stephanopogon and Percolomonas are a clade (Class percolatae: Phylum Percolozoa). J. Eukaryot. Microbiol. Corliss, J. O. 1979. The Ciliated Protozoa. Characterization, Classification and Guide to the Literature. Pergamon Press, Oxford. Hausmann, K., Hülsmann, N. and Radek, R. 2003. Protistology, 3rd ed. E. Schweizerbart’sche Verlagsbuchhandlung, Stuttgart. Hayward, P. J. and Ryland, J. S. 1990. The marine fauna of the British Isles and North-West Europ. Vol 1. Clarendon Press, Oxford. Larsen, J. and Patterson, D. J. 1990. Some flagellates (Protista) from tropical marine sediments. J. Nat. Hist. 24:801-937. Lei, Y., Xu, K. and Song, W. 1999. Two new species, Stephanopogon minuta n. sp. and S. paramesnili n. sp. from mariculture waters. J. Fish. Sci. China 6:25-28. Lipscomb, D. l. 1991. Broad classifications: the kingdoms and the protozoa. Pp. 81-136 In J. P. Kreier and J. R. Barker, eds. Parasitic Protozoa, 2nd ed. vol 1. Academic Press, San Diego. Lipscomb, D. l. and Corliss, J. O. 1982. Stephanopogon, a phylogenetically important "ciliate," shown by ultrastructural studies to be a flagellate. Science 215:303-304. Lwoff, A. 1936. Le cycle nucleaire de Stephanopogon mesnili Lw. (Cilié Homocaryote). Arch. Zool. Exp. Gén. 78:117-132. Patterson, D. J. and Brugerolle, G. 1988. The ultrastructural identity of Stephanopogon apogon and the relatedness of the genus to other kinds of protists. Europ Europ. J. Protistol. 23:279-290. Patterson, D. J. 1999. The diversity of eukaryotes. Am. Nat. 154:S96-S124. Simpson, A. G. B., 1997. The identity and composition of the Euglenozoa. Arch. Protistenkd. 148:318-328. Yoon, H. S., Grant, J., Tekle, Y. I., Wu, M., Chaon, B. C., Cole, J. C., Logsdon Jr. J. M., Patterson, D. J., Bhattacharya, D. and Katz, L. A. 2008. Broadly sampled multigene trees of eukaryotes. BMC Evol. Biol. 8:14. Yubuki, N. and Leander, B. S. 2008. Ultrastructure and molecular phylogeny of Stephanopogon minuta: an enigmatic microeukaryote from marine interstitial environments. Europ. J. Protistol. 44 (in press).